Vitamin C Infused Showers: Just a Hype? Hollywood stars like Leonardo DiCaprio have them, the MGM Grand in Las Vegas installed them in some of their rooms, so what about you? Most municipal drinking water supplier nowadays add a disinfectant, such as chlorine, to the water to kill disease-causing organisms or avoid bacteria growth. As more and more resistant pathogens appear in the water, disinfectant use is increased. If you want or need to avoid skin contact with chlorine or fear negative effects from breathing in chlorine evaporated from the water, a shower filter is the best option. But what type of filter medium is best for long lasting effect combined with low cost and maintenance? Most shower filtration devices contain activated carbon. This medium is proven to effectively absorb chlorine. Chlorine is attracted by the carbon particles, sticks to them and is removed from the water. One problem here is the limited lifespan of the activated carbon filter. The activated carbon sooner or later can not hold any more chlorine. Dirt from the water might clog the filter and reduce the flow rate. Vitamin C is a powerful anti-oxidant. 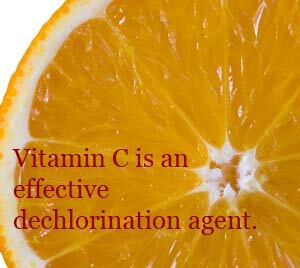 Vitamin C is also an effective dechlorination agent when it reacts with chlorine and chloramines. The resulting compounds are non-toxic. Aquaculture and aquarium owners use vitamin C for many years to help keep their fish healthy. If passive dechlorination is not practical, we recommend a form of vitamin C.
Once you decided to try vitamin C to reduce chlorine in your shower water, you can either buy a vitamin C shower filter or a vitamin C shower head. Filters have the advantage, that you can use you existing shower head and if you like also attach another type of water filter to them. Popular choices are the Vita-Fresh Shower Filter by UBS and the Sonaki In-line Vitamin C Shower Filter. Amazon offers quite a selection, see more choices here.